The intensive monocropping of rice in Rwanda has gradually built up the pressure of pests and diseases to alarming levels in several marshlands. The most common epidemics are blast diseases and diopsis pest. The status of nematode problems in rice fields in Rwanda has not been investigated so far. We carried out an explorative study on the presence of M. graminicola in rice fields in Rwanda and no symptom of root-knot nematode infection has been identified on rice. The hypothesis was that either the rice cultivars in Rwanda were resistant to M. graminicola or the lower night temperature combined with the soil texture and composition were the limiting factors to M. graminicola reproduction. The results of the infection experiments carried out in laboratory on 15 popular cultivars from Rwanda showed that those cultivars are not resistant to M. graminicola. However, several New Rice for Africa (NERICA) cultivars that were also tested were (not significantly) less susceptible than the control Nipponbare (Np). This agrees with the resistance of NERICA against a range of root-knot nematodes, resistance acquired from its parent Oryza glaberrima. Infection experiments carried out in simulated conditions of temperature (22°C day and 15°C night) that prevail in Rwanda marshlands showed that the mean number of galls developed per plant was reduced compared with the results at 28°C (optimal temperature for M. graminicola reproduction in general). Our results lead to the conclusion that, due to the fluctuating temperature, that varies in a regular way between 22°C and 15°C in Rwanda marshlands, combined with the clayey character of the soil, the reproduction rate of the nematode was slowed and the possible infection was hampered. Keywords: Rice cultivars grown in Rwanda, Meloidogyne graminicola, infection test, susceptibility and resistance. Copyright: © 2012 Nsengimana et al. Creative Commons Attribution 3.0 Unported License. Rice was introduced in Rwanda in 1950s through various missions from China and Korea (Kathiresan A., 2010). After the initial success of growing rice in the valleys near the capital Kigali and in the Southern province, a number of varieties became popular in the 1960s. These varieties, collectively referred to as Kigoli (Japonica type), are of the short and bold type. In Bugarama, the government introduced rice varieties from India (Indica type), such as Basmati 370 in 1980s. In 2001-2002, the national agricultural research institution, Institut des Sciences Agronomiques du Rwanda (ISAR), in collaboration with West Africa Rice Development Association (WARDA) evaluated a total of 990 rice accessions in farmers’ field through a participatory approach in four marshland areas (Kathiresan A., 2010). Since the introduction of rice for cultivation in 1950s, rice has become one of the major food crops grown in Rwanda. The fertile soil, favorable weather, natural water resources and available manpower make Rwanda highly suitable for rice cultivation. Furthermore, due to the advantages of rice grains such as long shelf-life, ease of cooking and transportation and less requirement of cooking fuel (compared to traditional food such as potato), rice has become a popular choice of food in schools, homes, restaurants and public programs in Rwanda. The rising incomes, growing urban population and changing lifestyles have further magnified the demand for rice. The intensive monocropping of rice has gradually built up the pressure of pests and diseases to alarming levels in several marshlands. Lack of knowledge on appropriate control measures against pests and diseases among farmers is a major impediment in raising the productivity levels. 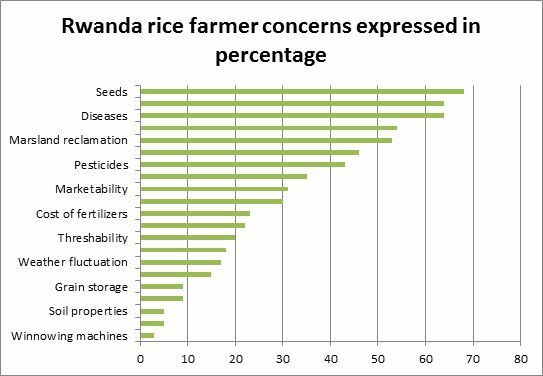 The figure below ranks the major concerns for the rice farmer in Rwanda (Kathiresan A., 2010). Fig. 1. Rwanda rice farmer concerns. The figure 1 shows the farmers' concerns. They appear downward in order of severity. The most challenging concern is the availability of rice seeds with good quality. The following are concerns not written in the legend: the 2nd concern is water availability; 4th, knowledge; 6th, availability of drying yard; 8th, fertilizers; 10th, water storage; 12th, credit accessibility; 14th, technical assistance; 16th, pesticides cost; 18th, milling; 20th, price of rice. The diseases rank the 3rd challenge. Nematodes are among important pests worldwide. Root-knot nematodes (Meloidogyne spp.) are one of the three most economically damaging genera of plant-parasitic nematodes on horticultural and field crops, particularly rice (Eisenback and Triantaphyllou, 1991). No survey on nematode problems in rice fields in Rwanda has been done so far. We analyzed the possible presence of the root-knot nematode Meloidogyne graminicola in main marshlands in Rwanda, and checked the commonly used rice cultivars for their susceptibility to M. graminicola. Our work was subdivided in two parts. The first part consisted in sampling and analysis of possible presence of M.graminicola in rice field. The second part was dedicated to in vitro infection test of rice cultivars from Rwanda. The first step for part I consisted in identification of sampling sites. Four sites were chosen on the ground that rice was grown there for more than twenty years; also, the sites are different ecologically and geographically. We have chosen the valley of Cyabayaga in the north-east, Rwamagana in the central-east, Cyili in the south and Bugarama in south-west. Cyabayaga marshland is located in east province of Rwanda, close to Uganda. The location data on Global Position System (GPS) are: South 01° 30.429’, East 030° 59.910’; elevation above the sea level is 1402 m. The soil type is alluvial mixed some time with laterite. Rwamagana marshland is located in east province of Rwanda, close to Kigali City. The location data on GPS are: South 02° 0.459’, East 030° 25.565’, and its elevation above the sea level is 1334 m. The soil is laterite, alluvial. Cyili marshland is located in south province of Rwanda, close to the Republic of Burundi. The location data on GPS are: South 02° 27.429’, East 029° 50.859’, and the elevation above the sea is 1394 m with a soil type of Clayey mixed with a little of schists . Bugarama marshland is located in south west province of Rwanda, close to the Democratic Republic of Congo (DRC). The location data on GPS are: South 02° 38.429’, East 029° 0.859’, and the elevation is 700-800 m above the sea level. This is the lowest part of the country. Its soil type is alluvial, loam (Verdoodt, A. and Van Ranst, E., 2003). To check for nematodes presence in rice fields in Rwanda, the samples were taken from two months old rice, at this stage the rice plants are physiologically active, the stem is not yet hardened and the secretion of growth hormones like auxin, which nematodes need for their efficient establishment (Chris Lee et al., 2009, Goverse et al., 2000), are active. For each site (among 4), ten spots were sampled and, for each spot, between 500 g and 1000 g of roots (not thoroughly washed) were collected. In the process of sampling, we were guided by indicators like: variety of rice; the appearance of the plant like good looking and bad looking plants (presence of some necrosis or yellowish appearance on leaves); the size of the field where samples were collected from each hectare; a zigzag pattern favored whenever possible (Ganpati B., 2011); and the soil type. Nematode extraction was done using the modified Barman funnel technique (Hooper D. J. et al., 2005) and the counting was done using a stereomicroscope (TAC-1030). In part II, we carried out infection experiments on cultivars grown in Rwanda in order to test their susceptibility/ resistance to M.graminicola. Fifteen (15) cultivars were tested. These are Yun Yin (Yyn), Basmatti (Bt), Insindagirabigega (Bga), Gakire (Ga), Intsinzi (Inzi), Nerica64 (Ne), IRRI, WAB3, WAT54, BR153, Yun Keng (Ynkg), Facagro (Fac), WAB-TGR, WAB5 and WAB4. In vitro infection experiments were done in two different conditions of temperature, i.e at 28°C, 12/12h light regime, and at 15-22°C, 12/12h light regime. Nipponbare cultivar (Oryza sativa) was used as control and this cultivar is susceptible to M.gramincola infection. It was provided by the national rice research institute center, Genetic Stocks Oryza Collection. Tested cultivars were brought from Rwanda to Ghent University and they have different origin (Kathiresan A., 2010). The M. graminicola culture was provided by Prof. Dirk De Waele (K.U.Leuven) and originally came from the Philippines. It has since been maintained on Nipponbare plants and grasses (Echinocloa crus-galli). The nematodes for infection test were extracted from 3 months old culture on Nipponbare. The SAP substrate mounted in PVCs tubes was used (Reversat et al., 1999). This substrate acts as support for rice root growth and offers an easy collection of the samples. The seeds were germinated on a round petri dish (θ = 14 cm) mounted with a moisturized filter paper. 100-130 rice seeds were laid on the wet filter paper, the Petri dish was sealed with parafilm and incubated at 30°C for 4 days in darkness, then moved to light for 2-3 days. The seedlings were transplanted (day 7) to PVC-tubes filled with SAP-substrate. Hoagland mineral solution (Haogland and Synder, 1933) was manually supplied to the plants in the tube. The plants were incubated (at 28°C, 12/12h light regime), and they were watered with distilled water 3 times a week. Twice a week 10 ml Hoagland solution was added to each tube immediately after watering. Nematodes were extracted as mentioned above and 250-300 nematodes contained in 1500 ml were inoculated in each tube. One set of plants was moved to a growth room where the temperature was set to vary from 22°C to 15°C, 12/12h, and the other set remained at 28°C. 14 days after inoculation, the plants were pulled out of the tube and the roots were thoroughly washed with tap water to remove all the SAP. The shoot and root lengths were measured. The roots were cut from the shoot and left at room temperature for 1 hour to air dry. The remaining moisture was removed by dabbing the roots with a paper tissue and their weight was recorded. The roots of each plant were wrapped in a piece of well-labeled miracloth (Chicopee Co.), which was tightened by stapling. The wrapped roots were dropped and submerged in a boiling fuchsin acid staining dye (75 mg acid fuchsin, 50 ml lactate, 50 ml glycerol and 50 ml distilled water) for 2 to 3 minutes. The roots were washed with tap water, unpacked from the miracloth, placed in 16 wells-plates (5 ml of distaining solution, 1:1 glycerol and distilled water with some drops of lactic acid in each well) and distained during at least two days on a shaker. The number of galls developed per plant was counted under stereomicroscope (TAC-1030). The parameters shoot length (sl), root length (rl), root weight (rw), number of galls per plant (gl) and number of galls per gram root (glrw) were analyzed using SPSS 16. The experiments were repeated three times. Table 1. Data on the plants at the time of taking samples. As it can be seen in table 1, we checked and recorded the characteristic of the rice plants by scrutinizing the roots and leaves. At a small extent (1 - 4%), roots presented necrosis. Also, leaves were examined where any yellowish or dry appearance were recorded. This ranged between 5% and 16%. Table 2. Average number of nematodes found per sampling sites. In table 2 above, it can be seen that Cyabayaga marshland has a relative high number of nematodes (150). The presence of stylet was checked and recorded. In Cyabayaga, all nematodes found did not show stylet and were assumed to be free-living nematodes. In Rwamagana, only 1% of nematodes were found to have stylet. It was the same in Cyili. In Bugarama, all examined nematodes did not show stylet and hence were assumed to be free-living nematodes. Fig 2. Number of galls per plant. In figure 2, the number of galls developed per plant was recorded. This number of galls has been expressed in term of galls per gram roots in figure 3. As can be seen on figure 2, in a batch of 8 cultivars Gakire cultivars appear to be more susceptible to nematodes M.graminicola than the control Nipponbare. According to the number of galls developed per plant, this Gakire is 59% more susceptible than Nipponbare. The cultivars Basmatti and Nerica64 developed less galls per plant (28% and 23%, respectively) and appear to be less susceptible than the control. By comparison between cultivars, Ga is significantly susceptible than Bt and Ne. However, the statistical analysis of the whole data showed that none of the height cultivars tested here is more susceptible or resistant to M.graminicola than the control in optimal condition for the prosperity of the nematode (28°C). The same trend of data holds when we expressed the number of galls per gram roots as shown in figure 3 below. Fig. 3. Number of galls expressed per roots weight of the plant. Fig. 4. Number of galls per plant recorded for the second batch of seven cultivars. The general trend of data in this experiment is that, in a batch of 7 cultivars, all of them developed more galls per plant than the control, except for the cultivar WAB-TGR. The cultivar FAC appears to be more susceptible with 10.71% more galls than the control. However, the statistical analysis showed that there is no significant difference between the cultivars and control in term of susceptibility to M.graminicola at 28°C. As seen for the results of the infection experiment at 28°C (blue bars), where none of the cultivars behaved differently from the control in terms of susceptibility to M.graminicola, the same trend holds in simulated condition of temperature varying from 22°C at day to 15°C at night. But, if we compare the behavior of each cultivar at 28°C and 22°C/15°C, we find a clear decrease of the number of galls developed per plant on both cultivars and control. For the control itself, our results showed a decrease of 57.9% of galls. The decrease was 47.66% for Ga, which is the cultivar that looked more susceptible than the control, and 8.3% for Basmatti, which appeared to be a bit resistant. For this second batch of tested cultivars, the general trend is that the number of galls developed per plant was reduced for each cultivar when we compare to the results at 28°C and 22°C/15°C. The decrease in number of galls was 21.96% for the control itself, 60.34% for the cultivars WAB-TGR, that seems less susceptible at 28°C, and 50% for the cultivars Fac, that tended to develop more galls than the control at 28°C. The presence of swellings (galls) on rice roots is a major indicator of parasitism of the rice plant by root-knot nematodes, which include M. graminicola (Bridge et al., 2005), while infection by migratory nematodes like Hirschmaniella species leads to the formation of small brown lesions that appear at the points where nematodes have ruptured the surface of the roots and entered. Damaged epidermal cells become necrotic and cavities form inside the roots as a result of damage to cortical cells (Taylor A. L., 1969). Our results showed that no galls were recorded in all samples investigated in Rwanda and only 1 - 4% of the roots presented necrosis. Taylor (1969) wrote that the presence of necrotic spots on roots is one of the symptoms of the infection of rice by migratory nematodes like Hirschmaniella species. However, this infection sign is not enough to conclude that the rice field is infested by PPN. In his personal communication, Bigirimana J., 2011, stated that the conditions for Rwanda and Burundi are almost identical for rice ecology, and both countries do have similar diseases problems, mainly Pyricularia oryzae, Pseudomonas fuscovaginae. They also have similar bad effect of temperature variation (chill nights) prevailing in rice field, iron toxicity and high salinity of soil. He went far to say that no nematode problems have been a case on rice in Burundi so far. The study done on soils of Rwanda by Baertsoen R., 1987, has determined the percentage of clay content and also the sandy, loamy, clayey and fine clayey of these soils. He found that 70% of the soils of Rwanda are clayey,with a clay content varying between 35 and 60%. In their report, Luc M. et al, 2005, and Sikora, 1989, showed that the soil texture and structure are directly related to water-holding capacity and aeration of soils, having a strong influence on nematodes survival, emergence and disease severity. They detected severe root damage on vegetables grown in sandy soils after paddy, but a total absence of damage in heavy clay soils after paddy. Moreover, the soil texture has an impact on nematodes migration toward the plants. In their study, Prot and Van Gundy, 1981, found that the migration of nematodes decreased with increasing clay content of the soil, with no migration in the soils with more than 30% clay. Our results showed few nematodes in sampled rice field in Rwanda and this should be due to the high clay content of the soils(35 and 60%). Our investigation on eventual resistance of Rwandan rice cultivars revealed that all 15 tested cultivars were susceptible to M. graminicola. The cultivars Basmatti and Nerica64 developed less galls per plant (28% and 23%, respectively) than the control, while Gakire looked more susceptible (Fig. 2 and 3). This result confirms the genetic resistance of NERICA cultivars. NERICA stands for New Rice for Africa and is a hybrid between Oryza glaberrima and Oryza sativa (Futakuchi K and Sié, 2009). The African rice Oryza glaberrima Steud is resistant to a number of nematodes, such as M. incognita, H. sacchari, and M. javanica (Plowright et al., 1999). Soriano et al., 1999, have shown that Oryza glaberrima Steud was also resistant to M.graminicola. The results of infection test in simulated conditions of weather in rice fields in Rwanda (average day temperature, 22°C, night temperature 15°C) showed that the number of galls developed per plant was reduced for each plant including the control where the decrease in number of galls was 21.96% (fig. 5 and 6). Strajnar P. et al., 2010, studied the effect of Slovenian climatic conditions on the development and survival of the root-knot nematodes M.ethiopica, which was first observed in Tanzania, a neighbor country of Rwanda. They found that M.ethiopica required 67 days at a temperature of 18.3°C, 48 days at a temperature of 22°C, and 36 days at a temperature of 26.3°C to reproduce. They further showed that, at a temperature of 13.9°C, the nematodes were unable to reproduce. This trend of less galls developed per plant in varying conditions of temperature confirmed our hypothesis that the climatic conditions in addition to the clayey texture of the soils may contribute to the absence of PPN in Rwanda. This research was funded by a doctoral grant of the Belgian Technical Cooperation (BTC-CTB) to Joseph Nsengimana. The authors express his profound gratitude to the ISAR (currently RAB) administration and researchers, particularly Dr. Gaidashova, for having provided useful information and allowed the access to their facilities. The authors also would like to thank Prof. Dirk De Waele, from the Catholic University of Leuven, for having provided the starting culture of M. graminicola. 1. Marchal, O., & Baertsoen, R. (1987). Au Rwanda: la vie quotidienne au pays du Nil rouge. Didier Hatier. 2. Bigirimana J. (2011). Liaison scientist and Coordinator for IRRI in Burundi. Personal communication. 3. Bridge, J., Plowright, R. A., & Peng, D. (2005). Nematode Parasites of Rice. In Plant parasitic nematodes in subtropical and tropical agriculture, 87. 4. Chicopee Manufacturing Co. Miracloth. Milltown, New Jersey. 5. Eisenback, J. D., & Triantaphyllou, H. H. (1991). Root-knot nematodes: Meloidogyne species and races. Manual of Agricultural Helminthology. New York: Marcel Dekker, 281-286. 9. Hoagland, D. R., & Snyder, W. C. (1933). Nutrition of strawberry plants under controlled conditions. In Proc. Amer. Soc. Hort. Sci (Vol. 30, pp. 288-294). 19. Taylor, A. L. (1969). Nematode parasites of rice. Nematodes of Tropical Crops. Albans, Herts, England: Commonwealth Bureau of Helminthology, 264-268. Some accession names of cultivars that received local names. Insindagirabigega (Bga) accession name is WAT -1395-B-24-2, Gakire (Ga) is TOX 4331-WAT-91-3-1-1-1, Intsinzi (Inzi) is TOX 4331-WAT-86-3-4-2-2-1. Nsengimana, Joseph et al. “Rice Cultivars Susceptibility/resistance to the Root-knot Nematode Meloidogyne Graminicola in Rwanda.” Open Science Repository Agriculture Online.open-access (2012): e70081903. Nsengimana, Joseph, Antoine Nsabimana, Svetlana Gaidashova, and Godelieve Gheysen. “Rice Cultivars Susceptibility/resistance to the Root-knot Nematode Meloidogyne Graminicola in Rwanda.” Open Science Repository Agriculture Online, no. open-access (December 12, 2012): e70081903. http://www.open-science-repository.com/rice-cultivars-susceptibility-resistance-to-the-root-knot-nematode-meloidogyne-graminicola-in-rwanda.html. Nsengimana, J. et al., 2012. Rice cultivars susceptibility/resistance to the root-knot nematode Meloidogyne graminicola in Rwanda. Open Science Repository Agriculture, Online(open-access), p.e70081903. Available at: http://www.open-science-repository.com/rice-cultivars-susceptibility-resistance-to-the-root-knot-nematode-meloidogyne-graminicola-in-rwanda.html. 1. Nsengimana, J., Nsabimana, A., Gaidashova, S. & Gheysen, G. Rice cultivars susceptibility/resistance to the root-knot nematode Meloidogyne graminicola in Rwanda. Open Science Repository Agriculture Online, e70081903 (2012). 1. J. Nsengimana, A. Nsabimana, S. Gaidashova, G. Gheysen, Rice cultivars susceptibility/resistance to the root-knot nematode Meloidogyne graminicola in Rwanda, Open Science Repository Agriculture Online, e70081903 (2012).